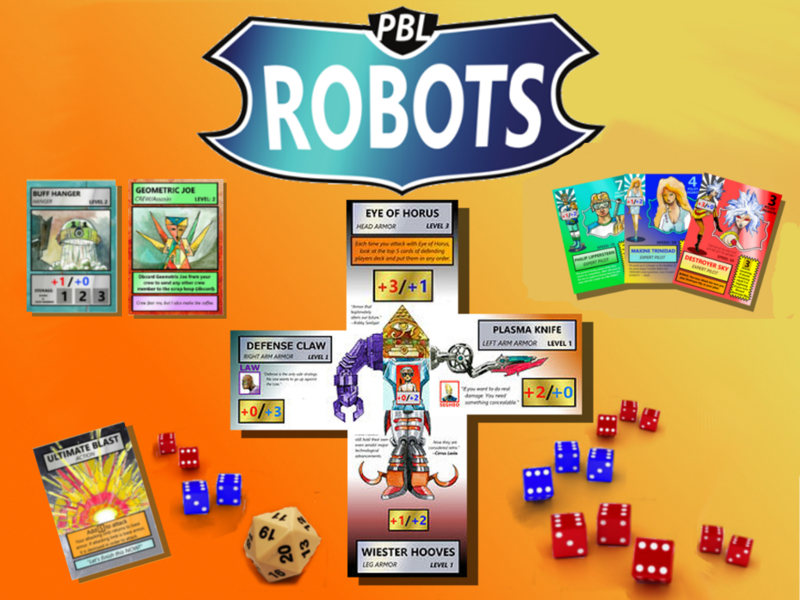 William Hessian and John „Sighless“ Supinski have spent the last year creating a brand new strategy card and dice game called PBL ROBOTS! „The game is a interesting mix of Risk and Magic the Gathering, except this game has giant 100 foot Robots!“ William said. The card game challenges each player to collect cards in a draft format in order to build their deck. When the battle begins each player slide their pilot card into the robot card, courtesy of a die cut cockpit in the center of the robot. Then players lay armor cards on the robot to watch the robot grow stronger and boost up the attack and defense. When players start attacking they roll dice to determine if the robot will blow of an arm, a leg or a head. Each pilot has a powerful critical form when you are down to one remaining limb, which gives the losing player a chance to make a comeback, but when a robot has lost of four limbs the game is over. William and John have spent their free time at their apartment on the East End of Portland, Maine developing this intense card game consisting of 113 unique cards and 3 different game play modes. William is a local visual artist and activist, working at Preble Street, teaching at Rivertree Art in Kennebunk and volunteering at the Meg Perry Center. William did all of the artwork and design for the game and originally invented the concept for the game over ten years ago in Minnesota, but did not start finishing it until meeting Sighless in 2012. Sighless is a local musician in the Bumbling Woohas and works at the Maine People Alliance, and was the host of Turnstyle Thursday open mic at CTN Channel 5 for over a year. Once Sighless began working on the game he created a business plan, invented characters and began writing back stories. A group of artists called the Hidden Ladder Collective, which William and John helped start, began play testing the game in-between hosting art shows, art making gatherings and busking out on the streets. Other members of Team Robots, Abbeth Russell and Kara Oster made important contribution to the game. Thursday, October 23rd the collective has launched the Kickstarter hoping to raise the $22,000 they need to print the first edition versions of the game. As of November 1st they have raised $7,000 towards their goal. Over 100 letters have gone out to game stores across the country. William and Sighless and PBL ROBOTS fans have been playing PBL ROBOTS demo events weekly at R Choice 2 Gaming Thursday Nights which is a free event open to the public. The group has been travelling to Louisana, New Orleans and the Midwest to demo the game. While the game itself is optimal for players 12 years and older, due to the high level of strategy, the game is also very appealing to a younger audience. William teaches art at Rivertree Arts in Kennebunk and his 4th to 6th grade students have loved the PBL ROBOTS cards. „The kids come back the next day demanding to have another glance at the game, and their parents follow right behind curious to see what the kids are so excited about,“ William remarked. Because of the kids persistence William and Sighless invented a new way to play the game that makes it a little easier for a younger audience, but retains the fun and excitement of the longer game. The popularity of the game is already growing with over 900 Twitter followers and over 200 Facebook likes. To check out their Kickstarter visit their website at: https://www.kickstarter.com/projects/robotcardgame/pbl-robots-dice-and-card-game (started at 7pm Thursday 10/23). The group is hoping to play the game with as many new players as possible all around the country while hoping to hit their goal by December! Dieser Eintrag wurde veröffentlicht in Crowdfunding, English, Fun, General und verschlagwortet mit Card, Dice, Game, Kickstarter, Robots von Sebastian Trella. Permanenter Link zum Eintrag.